Home Tags Posts tagged with "maternity style"
Maternity clothes? Yep. Can we just get rid if this question?! Sleeping? Better most nights. Pee breaks have lessened, for now! Best moment last week? Had a fun Valentine’s day with my husband and baby girl! Went out for dinner with my in-laws and this pregnant girl was so happy to eat at her favorite Asian restaurant and NOT feel sick! Movement? Lots! And in the same places as Lark! I suspect uterus shape has something to with that, or, this baby is breech again! Food cravings? Junk and sweets. That’s a problem now that I’m feeling hungry again. Also bagels, with lots of cream cheese and still on that cinnamon life kick too! Symptoms? Tired still. Guessing that’s not going away. Nausea is nearly subsided, but I still have moments during food aversions, which are becoming less too. Sinuses! OMG the snot!! TMI gas…skin changes. What I miss: an ice cold beer!! What I am looking forward to: warm weather…which feels like it’s NEVER coming! And a gender reveal!!! Total weight gain/loss? Officially up 2 lbs from my starting weight. Sleeping? Sometimes better, sometimes worse. Best moment last week? I’ve had some really hard days lately. It’s been emotional and I’ve had to face some hard moments. But any moment with Lark stands out because she keeps me grounded and sane! Her giggle puts a smile on my face every time! Food cravings? Basically just junk. Sugar. Soda….ugh…trying to hold back! Symptoms? Still tired. Nausea has calmed down A LOT!! Thankfully. Still have some food aversions here and there. My back pain isn’t quite as bad either, for now. Dizziness. Lots of sinus issues and headaches. This pregnancy is basically following the same pattern as last time! What I am looking forward to: warmer weather and hopefully getting out for some walks! It’s been too cold!! What I wore…except this week, at 35 weeks, it’s what I’d rather be wearing all day, err’day…because some days, pregnancy just ain’t a fashion show! I’m running out of options here, folks. And stubborn about buying new maternity clothes with only 5 weeks left. Not to mention, I’m uncomfortable these days and my favorite MNKR tee and any comfy pj pants are my staple upon getting home from work. I’m sure James is about ready to burn this tee and all baggy pajama pants. They’re really not very becoming on me. If I’m being real, and I am, this stage of pregnancy is not easy to dress on a limited budget. So many items I’ve been able to wear until now are getting tight, and most days, like today, I just don’t even want to attempt getting dressed. Everything feels constricting and binding and all I want to do is lay down anyway. New maternity clothes just aren’t an option. Sleep is awful and I’ve been having a lot of Toni Braxton Hicks contractions that sometimes catch me off guard. I’m chugging water and trying to rest when I can, to keep them at bay. But I’m also busy finishing up projects for little bean’s room, which is finally coming along. Typical Katie procrastinating, but I work so well under pressure! My main issue as of late, is evicting the old lady who I’m convinced is living inside the antique dresser I found for bean’s room, because it smells like a musty nursing home. This belly is round and so tight most days, I feel as though my belly button might burst like a balloon and I’ll go flying around the room like a deflating sack of air…but I’m trying to see the positive side since my BFF in California is stuck on strict bedrest and I am still (mostly) free to move around and do what I need to do. I’ve been lucky that I have been pretty comfortable up until this late stage of pregnancy, but the uncomfortable days have hit, and hit like a ton of bricks! 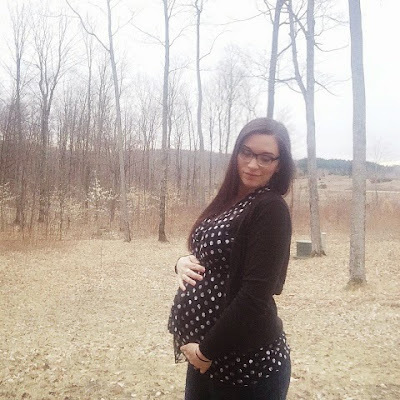 I’m still not ready to say that I’m over being pregnant, because even with what little ailments I’ve suffered, I’ve enjoyed being pregnant, much more than I ever thought I would. Call me crazy, but I may feel a little sentimental when this journey is over. But I’m sure I’ll happy as a clam when I can roll over in bed without looking like a dying, beached whale in need of physical intervention. 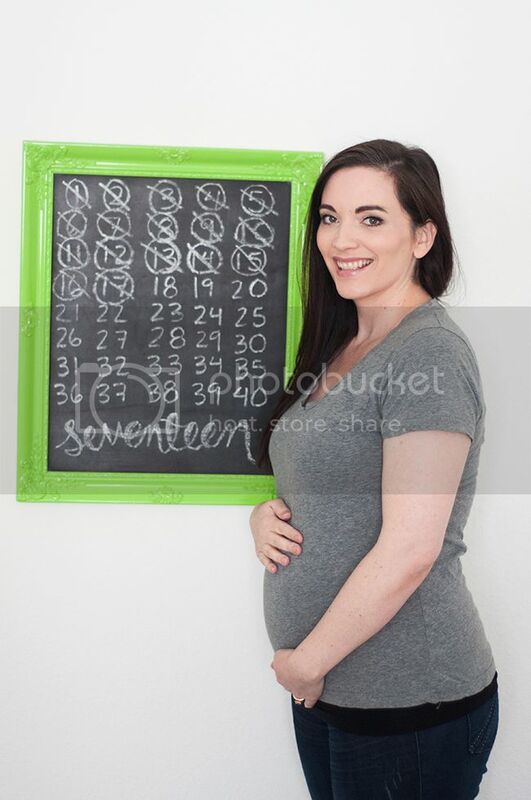 34 weeks has come…3 more weeks until I’m considered full-term and things are getting…well…interesting. Including feeling like a whale and having a stomach that gets in the way of everything! Not to mention, it’s August already…meaning I have a birthday in a couple of short weeks, and this baby is due shortly after that! Where has the time gone?! I’ve now hit a point where getting dressed is a chore. I feel very large and uncomfortable right now. I’d rather be wearing leggings and my favorite tee every day, but work frowns upon that. 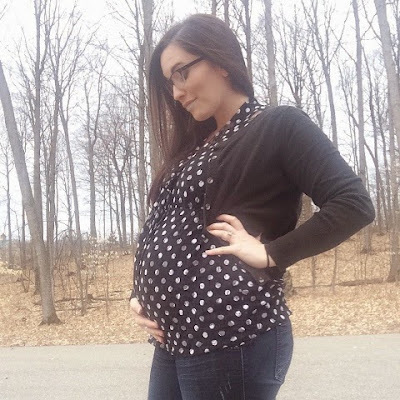 This coral scoop neck empire top is another I received from Thyme Maternity, and while it’s not a style or color I’d usually flock to, I do love it. The gathered waist detail gives the illusion of a waist and the fabric is soft and stretchy, so it’s amazingly comfortable! The color is beautiful too. I love coral, I just don’t really own many clothes in this color. Thinking this top could start a trend though! I found the top was a tad on the thin side, so I wore a white cami underneath since I tend to wear dark, full panel maternity pants and it would show through. It’s so lightweight, it’s perfect for these warm, summer days and almost feels like I’m in pj’s…almost! The sizing with Thyme clothing has been spot on as well. I’ll definitely get a lot of use out of my Thyme Maternity tops in the coming weeks. I feel like they’ll be perfect for transitioning out of pregnancy as well, since they don’t necessarily look like maternity and have a fitted look that will fit as I (hopefully) shrink to my normal size. These jeans are my “fat jeans.” You know, the ones you wear when you’re weight has fluctuated in the upward direction. And they’ve been really handy during pregnancy. I love them because they’re so broken in and comfy. They actually still buttoned until recently, but I still find myself reaching for them nearly every weekend with the help of a hair tie. At 34 weeks, a lot is happening, like struggling to see my feet. Which really isn’t new, it’s just getting increasingly difficult to bend over because of tiny feet in my ribcage. This tiny girl is on a mission to restrict my breathing in a major way. 34 weeks has also brought an onslaught of Toni Braxton Hicks contractions. I know I’d been having them previously, but they are getting to the point where they really catch me off guard. It literally feels like being punched in the gut, in the wind-knocked-out-of-me kind of way, not a painful way The difficulty breathing is so overwhelming that I have to completely change positions to get relief. So I’m thinking maybe labor is this feeling AND pain…sounds like buckets of fun! Oh, and just pointing out that I STILL don’t have that cute pokey-outty belly button that differentiates a pregnant woman from a beer-guzzling trucker…don’t think I’ll ever have one. It seems to be a never-ending crevice of mystery.